The social forums are flooded with the first look poster of Ajith Kumar’s Vivegam from this morning. One thing that all celebrities are awestruck is, about the physical transformation of Ajith for the film. 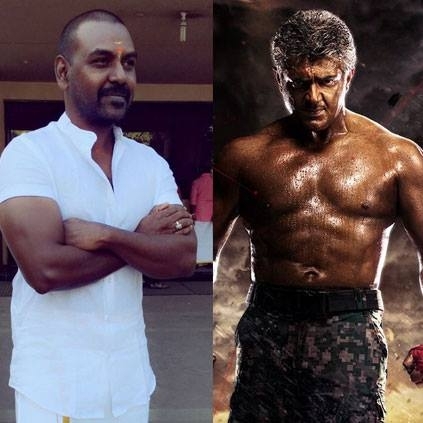 Here we have actor/director/choreographer Raghava Lawrence commenting on Ajith’s six packs look. “Hi friends and fans just saw the first look of Vivegam. I am very happy to see Ajith sir in six packs look. He has back problems, he has undergone so many operations in the past yet he has managed to transform into a fit six pack look. Ajith sir is an inspiration to many. I pray to Raghavendra Swamy for the success of Vivegam.” Lawrence took to his social forums to share this information. Did you know what happened at the shooting spot of Vijay 61? People looking for online information on Raghava Lawrence, Thala Ajith, Vivegam will find this news story useful.